Colour Filters for BW. 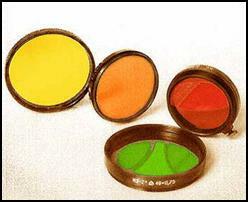 Most of the Jupiter and Industar lenses use 40,5 and 49 mm diameter filters. Still quite common and easy to find. However the FED-10, Industar 22 /50 lenses use uncommon 36mm slip-on filters. The red filter in the right picture is a Leitz deep red with clamping screw. In the middle, a Russian yellow 36mm slip on filter which came hitched on an Industar. The weird looking accessory on the right is a Flash Synchroniser. It screws on the shutter button’s cable release thread and has a PC outlet. I’m not sure how it works, but I use it with the shutter at “B” for open-flash exposures. Some of the pictures used here were shot with studio flash synchronised by this little gadget. Watch though for the thread pitch of some filters. Some Russian filters or lenses had a 0,5mm pitch. 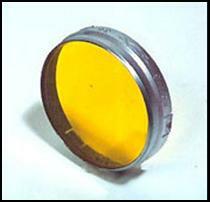 Modern filters use the 0,75mm pitch. One size could fit the other, but there would be risk of stripping the lens’ or filter’s thread grooves. One of the better developing tanks I’ve seen lately. Its nothing like any of the common metal or plastic tanks. The tank looks so deceptively simple that anyone would immediately suspect that it won’t work. The reel it uses is rather peculiar looking—with only one set of grooves, it would be hard to think if it could really hold film properly. I would not have been able to figure how this tanks works or how its reel is loaded if not for the detailed instructions given by Yuri BOGUSLAVSKY (of „FEDKA” fame). It turns out to be far EASIER to load than any Paterson type or Nikor type reel. And binding surfaces seems to be an impossibility with this reel. Minus factors though would be the slow chemical pour-in rate (critical for less than 10-minute developing times), a cap which sometimes floats (can be fixed with a rubber band), and rotation-only agitation. Historically, this tank is also notable since it is the same one described in the old Zorki and FED instruction manuals. Tank was given as a gift by Andrey OSTAPENKO of Krasnodar, Russia. To see how a soviet tank loads, click here. The little paper leaflet sometimes still found with the camera or lens is known as the passport. It contains the camera’s or lens’ identity- where and when it was made, who inspected it, and its price. More importantly, it is also the proof of whether the lens and the camera are still the same couple which left the factory together. 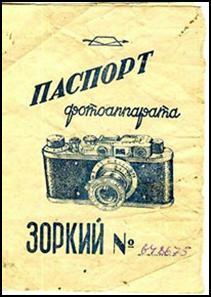 Both the lens and camera serial numbers are written in ink in cursive script. With lenses, the actual focal length and working distance are also given. 1. Leitz, Canon, and Zeiss film magazines will not fit in the FED or Zorki. 2. There were special 35mm film magazines supplied for the FED and Zorki. Early ones were heavy brass which had a lot of plush lining inside, with snap caps. Later ones are similar to factory film cassettes, also with snap caps. Kevin Kaslbeek has found some cassettes (similar to Kiev/Contax magazines) which were supplied with the FED-2. They will not fit the FED-1. 3. Plastic „ORWO” cassettes can fit without difficulty. 4. Most commercial factory-loaded film cassettes can also fit. 5. Later FED and Zorki should have no fitting problems. 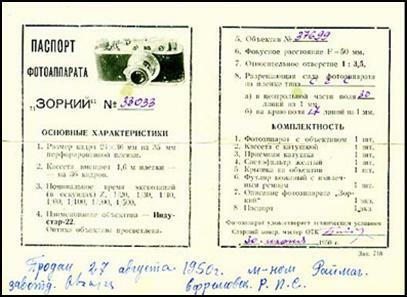 It has been observed that some prewar FED („NKVD”) and early Zorki (those with serial numbers above 115xxx) have tighter film chambers which cannot take in some types of factory-loaded crimped cassettes, notably, modern Kodak and Fuji film cassettes. „Kasseta” is made of thin metal , has slip-on caps and is painted black. 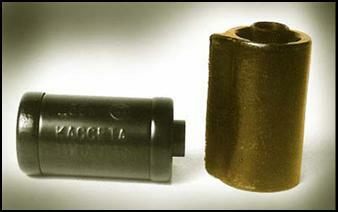 Magazine on the right, which came with a FED, is made of thick heavy brass. It is lined with plush inside and has tight flat caps.